​The Foundation of La Jolla High School is a 501(c)(3) non-profit set up to bridge the gap between what our school receives from the San Diego Unified School District and what we actually need to fund the top-ranked public education offered to all LJHS students each year. 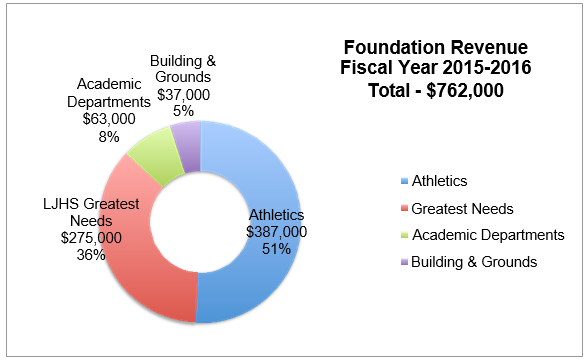 Approximately two-thirds of all donations received by the Foundation are “restricted” – earmarked by the donors for specific academic departments or athletic teams to cover expenses such as classroom supplies and coaches’ salaries not covered by the District. 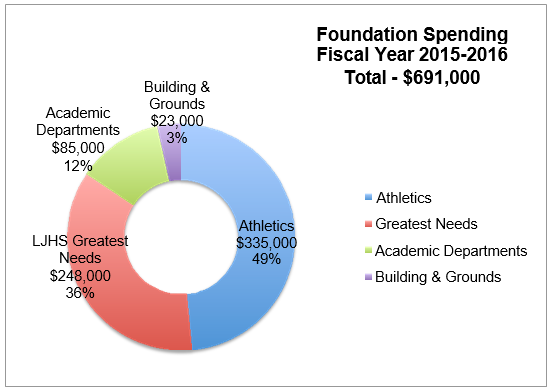 The balance of the raised funds are “unrestricted” – or general – funds, raised through major fundraisers to support all departments and students with new or ongoing needs not paid for by the District. College Admissions Advisor, Guidance Counselor, Athletic Trainer, Conditioning Coach, Computers, Spanish Textbooks, Enrichment Advisors -- Student Government, Speech & Debate Team, Music Program, Journalism, Yearbook, Drama, Math Club, Athletic Director, Cheer Advisor, Science Fair, and Science Team, Teacher Professional Development. Textbooks, supplemental fiction and non-fiction for library, classroom materials, science supplies, science lab stations, academic tournament fees, robotics supplies, marching band, instrumental music, field trips, composition & literature books. Coaches’ salaries, equipment, team uniforms, team travel, tournament fees, facility rentals, officials’ fees. General campus maintenance and improvements, landscaping, awnings, tennis court refurbishment. For your convenience, you may download a copy of our 2015-2016 Foundation of La Jolla High School by clicking on the file below.